Looking for a senior living facility near you? Let AvantGarde Senior Living and Memory Care help you! We offer a luxurious senior housing facility in Encino, CA. Caring for seniors can be overwhelming, especially if they’re dealing with Alzheimer’s. We understand that when people reach a certain age, it can be challenging for them to perform daily tasks and chores. No matter an individual’s situation, our senior living facility is designed to ensure seniors get the most out of life. As a licensed company, we always strive to cater to the ever-changing needs of the seniors we serve. We know that seniors have different interests, needs and objectives. That is why we offer luxurious living arrangements that suit their specific lifestyle, budget, and special requirements. To ensure everyone’s safety, our senior living spaces are equipped with the latest security equipment and tools. Our trained and experienced staff goes above and beyond to make sure seniors live a fulfilling life. They are kind, courteous and understanding and provide personalized care and support to each resident. Our staff receives education and training in how to best care for seniors. They use innovative and effective techniques to help residents. AvantGarde, we know what is best for seniors. 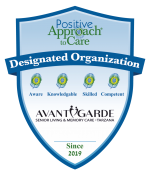 With AvantGarde, you can have complete peace of mind knowing loved one is in safe hands. If you have any questions, feel free to reach out to us. You can even take a virtual tour of the facilities at AvantGarde from the comfort of your home.